Reader Nick noted that on a recent road trip using an iPhone with the iOS 9 beta, Siri interrupted with warning that there was "heavy traffic ahead," and suggested a specific exit to avoid it. Later, Siri again warned about "roadwork ahead, with no traffic" while driving in Cleveland. The new construction warnings, at least, are accompanied by on-screen banners that indicate where the work is taking place and how far away it is. 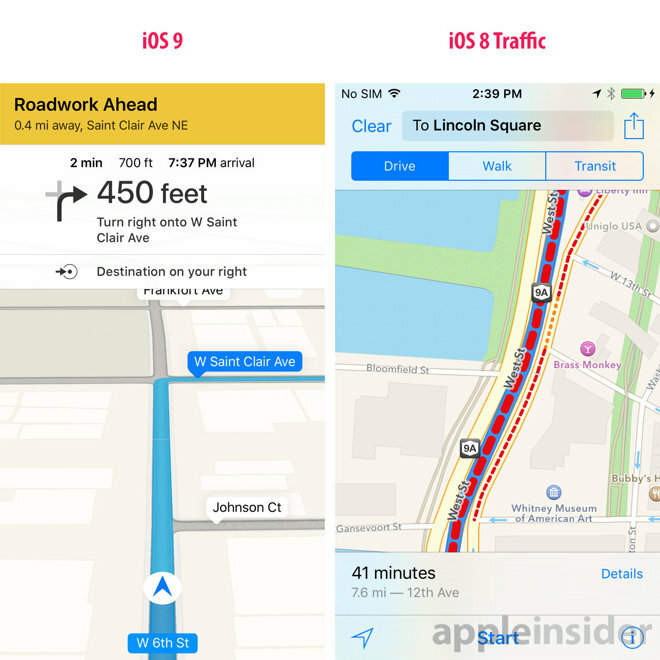 The iOS 8 version of Maps does incorporate traffic data, including alternate routes and details on the causes of backups, but the information is limited to route creation and estimating arrival times. Maps will come with a variety of improvements when it launches alongside iOS 9 this fall, the most requested being a return of public transit directions. Transit data was once a staple of the app, but support disappeared in iOS 6 when Apple moved away from Google Maps for its own in-house mapping solution. Transit guidance is one factor that has kept Google Maps popular on the App Store.